We will begin to find out tomorrow. No more Saturday shifts. No more holiday shifts. No more around-the-clock days waiting for the Senate–and for the first 15 years or so the House–to quit talking (after which reporters like those of us at the Missourinet often have two or three more hours of work to get stories ready for you to hear and read the next morning). No more sleeping at the office for a couple of hours after wrapping up election night coverage and then starting the day-after coverage, doing newscasts until staff members who have been in places such as Kansas City and St. Louis where they’ve been covering candidate victory/concession speeches return. No more long hours, irregular meals, and snacks that aren’t good for a reporter’s health. No more trying to penetrate the brick walls the Nixon administration has erected between reporters and news sources who know enough about an issue to answer questions the public should hear. But retirement is a sacrifice, too. It means an end to being on the front lines when things happen, witnessing the seldom-smooth operations of government, and then having the pleasure of telling people what all of it means. Mark Twain was wrong. Sometimes the making of sausage is something to see. And appreciate. It means not being able to walk into the Capitol as one of the many people who are SOMEBODY in the grand process of government. It means having no more opportunity than my neighbors have to walk up to one of the players in that process and ask them a pointed question my neighbors could never have a chance to ask. And get an answer. Will I miss those things? Not the first bunch, no. But the second tier? Sure. Being a reporter is one of the greatest jobs in the world. I’ve told a lot of journalism students that I can’t think of anything I’d rather have done with my life. To be where important things happen and then get paid to tell people about them—that beats any other job I can think of. And I’ve been able to be part of all of that for four decades with the Missourinet and several years before that in local radio. But it’s time to live by my own clock for a while. After more than a half-century in which a second hand has dictated when I have to start something and when I have to end it, when the schedules of other people dictate my schedule, when unexpected events change life and living for a while, it’s time to live by my own clock for as long as the Master of all Clocks allows. Some things will continue. The Missourinet wants me to keep doing the “Across Our Wide Missouri” daily historical program (if no station carries the program in your area, look for it elsewhere here on our webpage). There might still be contributions to this blog or another one–we haven’t figured that out yet. There might be some special projects to do. We’ll see how it goes. Some have suggested seeking public office. Not on your life. If I were to put a party label on my name, I would be throwing away a career that I hope has been an annoyance to people of all political philosophies. Managing Editor Mike Lear, a terrific reporter, is the new voice of the Missourinet. He and a new staff still have the responsibility of telling our consumers what state government is doing for, to, and with Missourians. They’ll be telling those stories on a growing number of different platforms, as they’re called these days, as the news media change and as the public finds new ways to stay informed (I hope the public wants to stay informed, not just managed or manipulated). But the responsibility is unchanged and Mike is capable of leading the staff in meeting it. From time to time in these columns, this observer has written critically about government and the people who serve in it. On balance we probably have been more critical than praiseworthy. But we read something long ago from a minister who responded to a complaint that people only talk about bad teen-agers and never have nice things to say about the ones that don’t cause trouble. True, he said, but there’s nothing praiseworthy about doing what you’re supposed to do. It’s only when you fail to meet society’s expectations that you get the criticism you deserve. It’s only when you exceed those expectations that you deserve praise. That observation applies to people in all walks of life, not just to teenagers, but especially to those in political office. Let us remember that politics is a human process filled with error and shortcomings and sometimes a lack of nobility or what Roosevelt called “high achievement.” It nonetheless takes courage to seek a place among those in the arena, especially in today’s climate of anonymous campaign character assassinations. Those who win should have the courage to serve in that arena, understanding that all who seek or demand help (often with an “or else” attached) are not necessarily those who most need help and to act accordingly. It is the responsibility of the private citizen to expect a higher standard of the republic’s leaders. It is the responsibility of the vigilant press to make sure that citizen has the knowledge to do his or her duty. It’s time to be one of them, reading and hearing the things those in the Capitol Press Corps tell me so that I will be a good, not average, citizen who will expect the standard of our leaders to always be higher. to screw things up the Capitol. This a an inside-baseball story of behind-the-scenes machinations of state government that probably won’t do much harm to the general public. But it’s a tale of dysfunction and the growth of government among some people who claim they want limited government. 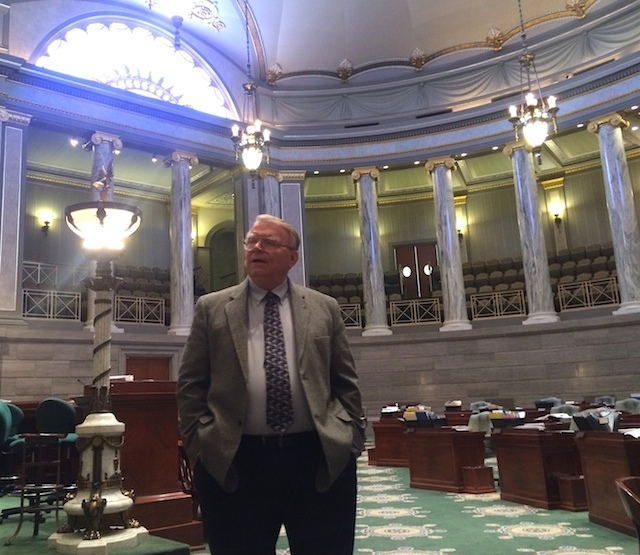 An email from Associated Press Bureau Chief David Lieb arrived in the Missourinet newsroom last Wednesday telling us and other members of the Capitol Press Corps that the Senate has decided to kick us out of our present office space before the next session starts in about five weeks. The abrupt notice from Senator Mike Kehoe on behalf of the Senate Administration Committee is the first we had heard about this. He called David while David was covering disturbances in Ferguson. Pretty lousy way to do business. This isn’t the first time the press corps has been moved. When the Missourinet went on the air in 1975, there were two press rooms, as there are today. Room 200, now House of Representatives offices, was occupied by the Associated Press, United Press International, the original Missouri Times, and the Missourinet, which shared a former closed with the University of Missouri reporting program. Room 318, as we recall, was for the metro papers—the Post-Dispatch and the Globe-Democrat from St. Louis and the Kansas City Star and Times. There might have been a few other papers in that space, too. That’s when we were moved to the first floor spaces we now occupy. Earlier this year the Senate decided to remodel and restore a gallery above the dais at the front of the chamber. That meant the Senate Information Office, which occupied that space, had to move somewhere else. That staff now temporarily occupies a hearing room across the hall from one of the press rooms. Come January, that space will be needed for committee hearings again. Someone has come up with the bright idea that the Senate Information Office should take over the present press rooms. Perhaps that same genius has decided that the press corps should be moved to the basement into some office space used by the Lieutenant Governor and then at some time after the session ends next May, move the press corps AGAIN to some space on the fifth floor of the Capitol. Then the Senate plans to move the Senate reporters from the table on the Senate floor where reporters have sat for decades and written notes or recorded debate to an area upstairs that is part of the visitors gallery. You might remember a couple of years ago when House Speaker Tim Jones or some misguided soul on his staff thought it would be a splendid idea to build offices for the House staff in the House Press Gallery, a plan that would have destroyed an important architectural feature of the House and severely restricted the working space of the reporters covering the house and even wiped out the space used by the Department of Education’s video crews to telecast and webcast important events in the House. That idea got enough ridicule here and in other places, including the metropolitan press, that Jones wisely backed down and ordered the partitions that already were being built to be removed. He did the right thing and the Capitol was spared another ugly defacement at a time when it needs exactly the opposite—repair and restoration to the great building it is supposed to be. Now we have the state Senate talking about turning part of its visitors gallery into a press area. We haven’t been told why the Senate has decided to get rid of reporters on the Senate floor but we would not be surprised if the move is not being made so the Senate staff can use the table. It appropriated a similar table used by reporters on the other side of the chamber several years ago. Staffers have become increasingly essential on the Senate floor because Senators are unable to write their own amendments to bills and have to have research staff members at that table write them for them. In fact, the Senate often stops debate so a member who has not prepared for debate by knowing what bills are on the calendar and having possible amendments pre-written can go to the staff table and consult about what should be said. We are making this assumption because there has been no explanation from the Senate otherwise about why all of this shifting around is necessary. We are only suggesting the reasons because of our years of observing the way the place operates. Perhaps there would be space for the Senate Information Office if each party did not think it necessary to have its own public relations person and staff. There’s already an information office for the entire Senate, the one now operating out of the committee room. But for some reason the R’s and the D’s don’t think the Senate Information Office can serve the SENATE. So the Senate, which pats itself on the back as the legislative chamber that is less partisan and far more collegial than the House of Representatives, has partisan PR staff people. And they, as far as we know, are not being moved (or dispensed with). But the office that serves the entire chamber has moved and appears to be headed to the rooms now used by the press corps. We have not talked to all of our colleagues but we know some are, shall we say, in a state of great urinary agitation. Moving the press corps is far more complicated than unplugging some computers and moving them to the basement and plunking them down in some cubicle of some kind until they can be moved again in a few months to the fifth floor. But nobody from the Senate has thought it necessary to find out what reporters need to do their jobs. We not only don’t know what space will be available in the basement or in that fifth floor area, we don’t know who’s going to pay the costs of the necessary wiring, cabling, internet accessing—any of that stuff. Nobody on the press corps has been invited to look at the basement space or at the fifth floor space as far as we know. Nobody has been asked what is needed to do our work. The press corps includes two radio operations. The Missourinet broadcasts newscasts during legislative sessions from our present Capitol studio. Some of our affiliates come to the Capitol during the session and use our studio for their morning talk shows, inviting numerous state leaders to appear with them. The Missourinet spent quite a bit of money to build the studio for that capability. Our company paid for the soundproofing, the carpeting, the wiring and all of the other stuff needed to make that work. We have a secondary space where guests waiting to be on the program can sit. It would have been courteous of the Senate to discuss how we can continue to serve our listeners and the listeners of affiliates in several Senators’ districts in the new quarters. Is our company going to have to spend several thousand dollars more, twice? The message last Wednesday was all we have heard. St. Louis Public Radio also has a studio as part of its office. Although it is not as elaborate as ours, it nonetheless is something more than a room with a desk in it. In the process of all of this poor thinking, the Senate–as the House did a couple of years ago–is attacking part of its own architectural beauty by moving the press corps to a visitors gallery. Does the Senate know how much of the gallery it have to will tear up to provide the space that reporters need? Does it know what technical needs those reporters will have? Is it ready to see computer cables and power cables hanging over or from tables or whatever writing and computer surfaces it will have to provide? Will it issue periscopes to members of the press so they can see around the columns that will block their views of what’s going on and who is speaking? Some readers might find these words to be merely those of a petulant reporter who wants to defend his hallowed turf. Not at all. Okay, maybe a little bit. But the Senate’s handling of this issue is at the least discourteous, disorganized, and kind of shabby. And for those outside the Capitol who think government is dysfunctional, well, here’s some more ammunition. Your loyal scribe will not be affected by these changes because he will be gone before these changes take place. But his news organizations will be affected and his colleagues will be affected by this dissonant game of musical chairs the Senate has created. Thirty-five years ago or so, the last time the press corps was moved, technology was pretty basic. We were still using our trusty Royal manual typewriters. The internet was a dream. The word “wireless” had not entered common conversation. And Senators wrote their own amendments. The senate now proposes to disrupt the Press Corps’ abilities to do our work of telling the public what their elected Senators are up to. We suppose, however, we should be pleased that we were notified of this scheme before the construction workers showed up one day and started knocking down our walls. Does it seem ironic that the Senate INFORMATION office has for several months been across the hall from the press room complex where the Missourinet has its Capitol office and studio and where five newspapers have their offices, but the first INFORMATION the Missourinet and our Press Corps colleagues received came in a telephone call from one Senator to one reporter who then sent an email back to Jefferson City from Ferguson? Bu, hey, let’s do give the Senate a little credit. In this instance, the staff at the other table didn’t have to make the call for it.